Luminaria Bags, also called paper bag lanterns, are available in a variety of craft designs like this one can be placed to light up your Wedding Ceremony, Christmas paths, courtyards, or event spaces. 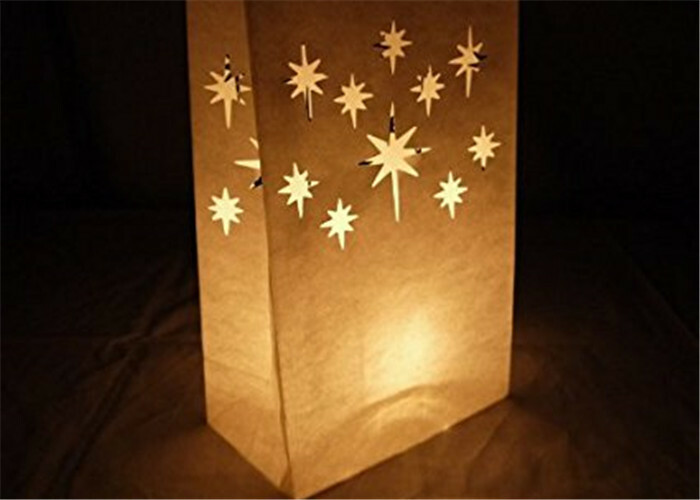 Paper luminaria craft bags are also fire retardant, we recommend using our flameless LED luminaria light. You can use multiple light sources in each bag as well to increase the brightness. Paper luminary bags are used to light up for weddings, parties, or ceremonies. Luminaries create a beautiful pathway light in dark areas and enhances the mood for any occasion. This luminary bag is off white in color and has cutouts of starburst. Use a LED tealight candle when lighting up these bags, you can place multiple LED candles in each bag to get the desired brightness. Lights, Wedding Decor, Premium Quality, Selection and Service. 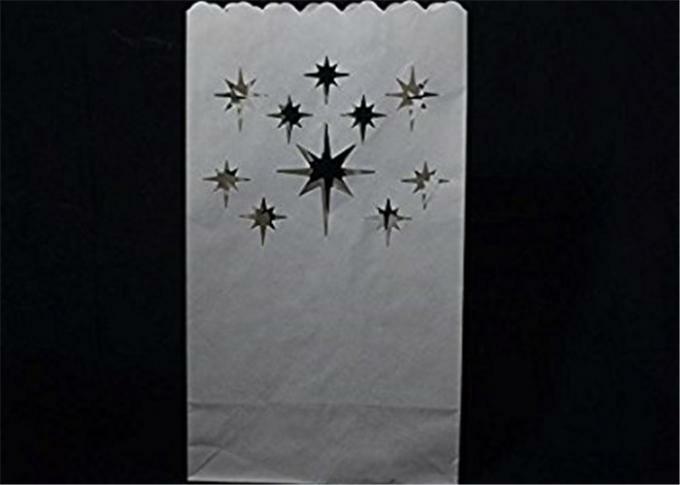 Luminaria Bags, also called paper bag lanterns, are available in a variety of craft designs like this Star and can be placed to light up your Wedding Ceremony , Christmas paths, courtyards, or event spaces . Our DIY Luminary bags can be used with candle lights, tea lights , or LED lights to create a beautiful night-time display. Our luminaries will illuminate your party, set the mood and create that warm, soft and serene ambiance atmosphere. -If you have any question, please send message or email to contact us directly, we will reply it within 24 hours and do our best to solve it. All completed goods will be packed by the standard export carton to protect the goods from damage. We also welcome QC from customer's company to check our quality. Our products: fashion design, superior quality, competitive price, easy to carry, suitable for shopping, promotion, advertising, gift or others. Welcome to inquiry, we will offer our best price to you. Please kindly let us know the following : size,quantity,color, other details and test request. Samples will be ready within one week. Pay deposit once all details and order are confirmed. Pre-production sample will be sent to you for the color,size,and craft approval.All package accessories will be talked and confirmed with you soon afterwards. Top samples or seal samples will be offered for package approval and goods inspection. Please kindly let us know the forwarder agent info three weeks before the goods shipment. The balance should be paid against the B/L copy.